Intermodal: U.S. railroads originated 996,022 intermodal containers and trailers in June 2012, up 5.2% (49,168 units) over June 2011 and an average of 249,006 units per week. That’s the highest average for any June in history and the third highest average for any month in history (behind August 2006 and October 2006, see top chart above). In the second quarter of 2012, intermodal loadings were up 4.0% (121,369 units) over the second quarter of 2011. For the first six months of 2012, intermodal originations were up 3.3% (193,541 containers and trailers) over the first six months of 2011. Through June, year-to-date 2012 U.S. intermodal originations were slightly ahead of 2006, setting up the very real possibility that 2012 will be the highest-volume intermodal year ever for U.S. railroads. The recovery since 2009 has been remarkable. In the first six months of 2009, average weekly intermodal loadings were 185,075 containers and trailers. In the first six months of 2012, the average was up to 232,682 containers and trailers, a 25.7% increase. Assuming 240 intermodal units per train, the improvement in 2012 over 2009 is equal to nearly 200 additional full-size intermodal trains per week. Carloads: U.S. rail carload traffic in June 2012 wasn’t as encouraging as intermodal traffic, but it was better than it’s been lately. U.S. freight railroads originated 1,140,271 carloads in June, an average of 285,068 carloads per month and down 1.3% from June 2011. That’s the lowest percentage decline in five months, mainly because coal carloads weren’t as lousy as they have been. Coal carloads in June 2012 averaged 114,485 per week, the highest weekly average in four months and down just 6.2% from June 2011. Excluding coal, U.S. rail carloads were up 2.2% (14,979 carloads) in June 2012 over June 2011. That’s their lowest year-over-year monthly increase in six months, though the weekly average in June 2012 (170,583) was the second highest (just behind April 2012) since October 2008 (see bottom chart above). Excluding coal and grain, U.S. carloads in June 2012 averaged 151,363 per week in June 2012, up 4.2% (24,138 carloads) over June 2011 and their highest weekly average since August 2008. U.S. carloads of petroleum and petroleum products continued their startling growth in June 2012, rising 51.0 percent (14,177 carloads) over June 2011. Carloads of motor vehicles and parts continued to grow rapidly in June 2012 as well, with U.S. carloads up 24.5% (12,957 carloads) and U.S. plus Canadian carloads up 22.5% (16,545 carloads) compared with June 2011. Bottom Line: The AAR points out that rail freight is a "derived demand" industry, meaning that the demand for rail delivery occurs as a result of demand elsewhere in the economy for the products that railroads haul (inputs, raw materials, parts, lumber, chemicals, autos, etc.). Therefore, weekly and monthly rail traffic activity is a useful gauge of broader economic activity, especially of the "tangible" economy. Except for a decline in coal and grain deliveries this year, most other products delivered by rail have been increasing, and overall intermodal rail traffic was the highest ever for the month of June, and on track to set a new annual record in 2012. Rail car traffic excluding coal was the highest for the month of June since 2008, and rail car loadings have been at 4-years highs in each month this year. Overall, the June report from the AAR on U.S. rail activity suggests that the economy is continuing to make gradual improvements, and there is nothing in the report that would suggest that the economy is heading towards a recessionary cliff. In a similar vein, trucking is also rising. The amount of freight moved by truck (as measured by the ATA Truck Tonnage index) rose to the highest level on record in May, both for the monthly number and 12 month moving average naturally seasonally adjusted number. The Dry Van Haul Rate also rose to $1.53/mile, the highest total on record. This rate is what freight companies charge to ship products and does not include a fuel surcharge. Rising prices indicate increased demand. Both these data series are very good, reliable leading economic indicators. Taken along with the railroad data, we see freight increasing in the US. We're are two tracks here. can someone offer some insight? The railroads are hiring to replace thousands of baby boomers that are retiring. This will help slightly with unemployement and provide very good paying jobs. Carloads are down. Intermodal is up with auto sales finally rising; however there is some question about how much channel stuffing GM is doing. Warren Buffet's railraod is hauling a lot of oil that should be shipped via the Keystone XL pipeline. Manufacturing is finally growing but the mix is much different. Thousands upon thousands of textile, garment, small piece work jobs have been shipped offshore. They have been replaced by fewer jobs producing more Boeing airplanes and the like. WalMart is growing while Sears is shrinking. GDP is under 2% and probably somewhat negative after factoring in inflation. The numbers are being spun for Obama. But Food stamps, welfare, and unemployment tell the true story. 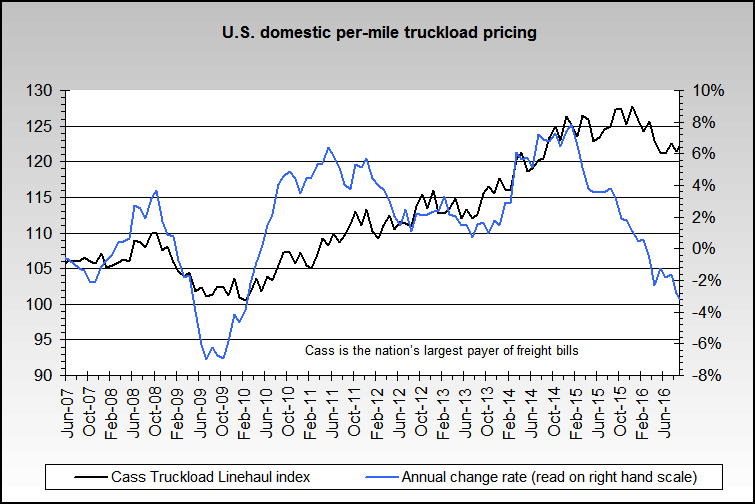 The Cass Freight Index, although up, is barely at the levels of 1998 or 2001. Expenditures have over doubled since 2002, reflecting inflation which is much higher than generally recognized. 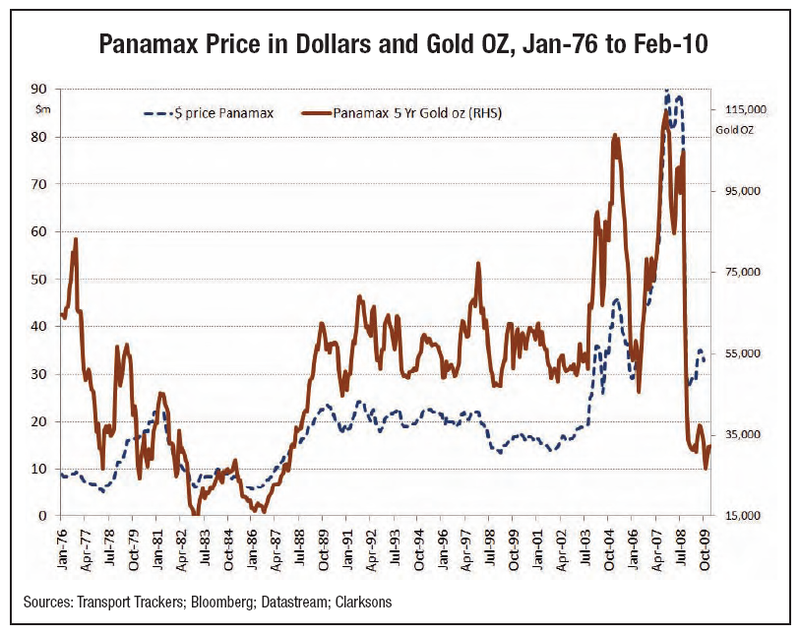 Interesting how the Panamax freight index parallels the gold price. Larry G, if the numbers are broken down by industry, I bet the gains in transportation are outnumbered by the losses in construction and real estate since 2006. Every industry but health care and education has negative numbers. be interesting to see the same chart for 2011 or first half 2012 but 8.2% unemployment just does not "jive" with all these "indicators are up" stories. How can the indicators be going up but unemployment persists? you'd think that, for instance, increased rail traffic - means more goods being produced and transported and that more produced goods would require more labor but it's appearing that more and more industries are more and more automated and can boost production without hiring more labor. But then SOMEONE has to be BUYING the increased goods and the unemployed are not, so who is? I think the traditional ways we have measured economic output are no longer really accurate indicators anymore - that the basic way the economy functions - has changed and we're using stale/obsolete measurements that do not truly reflect the real state of the economy. I have nothing to back this up - just the feeling that the indicators seem to be out of whack with the employment data. Well, the explanation is how we measure the unemployment rate. Please bare with me because this gets a little complicated and a lot crazy. The unemployment rate is the number of people unemployed (U) divided by the number of people in the labor force (LR). A person is unemployed if and only if s/he is actively searching for employment. A person is a member of the labor force if and only if they are actively working/looking for work and are not institutionalized (in school, prison, the military, etc). During the recession, we saw a number of people just stop looking for work, which means they were not counted in the unemployment rate. Now that the economy is improving, they are reentering the work force. So, despite the fact that the economy is adding jobs at pre-recession rates (non-seasonally adjusted basis), the unemployment rate remains stubbornly high because the folks who were not part of the labor force are now reentering it. The TL;DR version of this: we have a lot of backlog of workers to get though. yes. and I suppose new young folks entering the job market at a time when job creation is less than the added numbers of young looking for work. but it seems like we have not seen this kind of disparity in numbers before - that's it's a "new" phenomena. 2. related to 1. - how does the current employment level in a given indicator/segment compare to prior years? In other words, if an industry crashed... even though we're looking at increasingly better indicators, the over state of the industry may still be not near as good as prior years. the problem with the "snapshot' approach is it may actually be a distortion of the overall context trends. moving halfway up from a crash to about 1/2 what you used to be and now stuck is not really a full recovery. that's it's a "new" phenomena. It's "new" in that it hasn't happened since the Great Depression, but our economy has gone through periods like this before. It is hardly unprecedented. Yes. And no. it depends on what you are measuring. Employment is often a terrible indicator for the state of the economy for several reasons: 1) employment lags economic activity (companies don;t start laying off workers until a recession is underway and will not start hiring again until a recovery is underway) and 2) the level of output is not dependent on employment. Much has been made about the slow jobs recovery over the past few years, and most of it is legitimate. But companies learned in this past recession (as they do in every recession) to do more with less: less workers, less resources, less cost. The economy can be in a recovery while jobs remain relatively weak: firms are ramping up production with their current equipment. One thing we are starting to see, however, is firms at the far end of the production chain (manufacturers and wholesalers) are increasing their workforce. I expect this to translate through the entire supply chain as we progress through 2012.
" The economy can be in a recovery while jobs remain relatively weak:"
this is one part that is harder to understand. If unemployment is still high but production is increasing - WHO is buying MORE STUFF? One would think (perhaps wrongly) that increased production is IN RESPONSE to higher demand and that higher demand comes from more people buying stuff because they have more money. I realize this is a bit of a chicken/egg situation... but if we have a lot less people with jobs ...those folks are not going to buy more stuff (increase demand) so when the "indicators" are "shipping more goods" once presumes it is in response to more folks buying stuff. where have I got it wrong? Some of it is exports. Some of it is the some 3 million more people working. Some of it is more consumer spending thanks to reduced energy prices (such as natural gas). Some of it is business activity (business-to-business activity is at an all time high and growing).